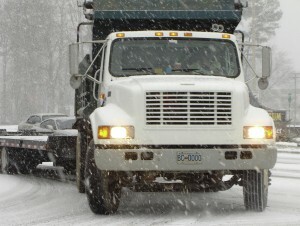 Winter means snow, ice, rain and cold temperatures, making for hazardous road conditions. Anticipating these hazards and knowing how to “read the road” will help you safely respond to changing road conditions. Conduct a thorough pre-trip inspection. Ensure that tires and chains are in good condition. Safely remove any snow from windows, lights and trailer; clear lights periodically. Make sure the load is properly secured and balanced. Know how safety features such as ABS, ESC or collision mitigation technologies work in winter weather. Exercise increased caution when bobtailing or driving with no load as you have less weight on the rear axle. This makes it harder to steer, stop and go. During hard braking, a truck will shift its weight to the front tires, reducing braking effectiveness. Turn off retarders (e.g. engine brakes) whenever the road is slippery. Retarders may cause your truck to lose traction. The goal is to have even braking on all axles. Turn off cruise control in adverse weather. DriveBC.ca for highway conditions and highway cams. Toll-free 1-800-550-4997 for 24-hour B.C. road information. Weather.gc.ca for B.C. weather warnings. ShiftIntoWinter.ca for ways to prepare for winter driving. Talk with your dispatcher, especially during severe weather advisories. Comply with the written safe work practices of the company you haul for. Respond to driving messages posted on fixed and digital highway signs. Talk to other drivers about the latest road conditions. 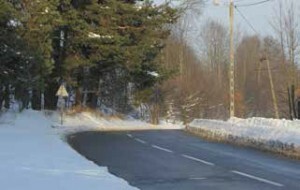 Various road surfaces react differently to cold temperatures, snow and ice. (For example, asphalt can sometimes offer less traction than concrete.) In addition, be attentive to contours and defects in the road, such as the crown, the angle of curves, potholes or frost heaves. Use chains when you need them, or when directed by signage. Maintain your momentum; if your drive wheels spin, ease off the throttle. Ensure you have sufficient traction; if not, chain up before the grade. Reduce speed before the grade. Slow to below the posted speed limit before entering the curve. Avoid braking in a curve — available traction can change mid-curve. Avoid hazards on the road surface. The amount and type of tire spray can tell you a lot about the road condition. A slushy spray that dirties windshields and leaves brown snow on your grill means good traction. If there’s less spray, but the road looks wet, beware – the road’s beginning to freeze. A coarse spray with ice crystals can signal a freezing road and ice. White snow on your grill means limited traction. If the road is wet with little or no spray, you may be on black ice. 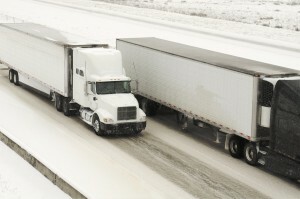 When driving through heavy slush, trucks and buses can throw spray onto your windshield and limit your ability to see. Drive defensively and leave enough space between you and vehicle in front to minimize spray. Shaded areas, bridges and overpasses attract black ice. Approach with caution. Shaded areas, bridges, and overpasses freeze sooner in cold temperatures. Approach them with caution. A rainy winter day or night can mean ice the next morning if temperatures drop below freezing overnight. In warmer weather, a light snowfall might melt when it hits the warmer road and turn to ice when temperatures dip at night. When temperatures fluctuate between +5° and -5° C, watch for black ice. Looking in the distance for hazards. Slowing down and driving for the conditions. Establishing and maintaining a safe following distance and increasing lane spacing where necessary. Avoiding aggressive braking and sudden steering. Being prepared to correct a temporary loss of vehicle control. Planning ahead and postponing travel during adverse conditions.